There’s a word in the English language which I don’t like to use very much, if at all. Not because it’s particularly difficult to spell or challenging to pronounce - in fact, it’s rather succinct and actually describes a place which I’m sure most men would agree is rather a nice place to visit. However, unless one is participating in redneckery it’s usually inappropriate to use it in the company of others. That’s what sort of a job this retaining wall tanking has been today. I’m using a water based product, which describes itself as a “one part latex-modified bituminous elastomeric waterproofing membrane”. Personally, I’d use rather fewer but somewhat more colourful adjectives but to be fair, there are far worse things to paint a wall with. The biggest contributor to this job’s declaration as a colloquialism for a location in the female anatomy is the fact that there is very little room between the retaining wall and the hillside cutting. In places there is no more than 300mm, and squeezing in there sideways with a paintbrush dripping in a fluid designed to stick to anything, trying to thoroughly and completely seal the joint between the first course of blockwork and the slab is less than comfortable. I will be peeling this stuff off my hands for weeks to come, I’m sure. If I have it in my hair, it will remain there until it gets cut off. Above the first course of blocks I’m applying the sealant with a paint roller and extension pole from the hillside which has actually been reasonably straightforward, if not terribly speedy. 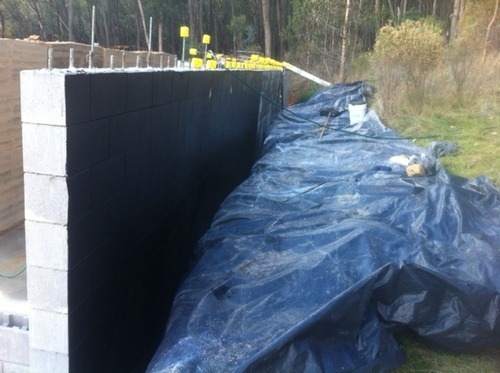 The problem with pace has been that the dry-stack blockwork I’ve used to construct the wall forms a 3 or 4mm wide vee between each block, which has to be filled with sealant in order to seal the wall. Ensuring that every joint is sealed from my position on the hill has been challenging, but I’ve attacked this problem by slathering the stuff on thick with two coats. So I have a little over half of the wall coated, and the wall-to-container flashing prepped ready to go on first thing in the morning. 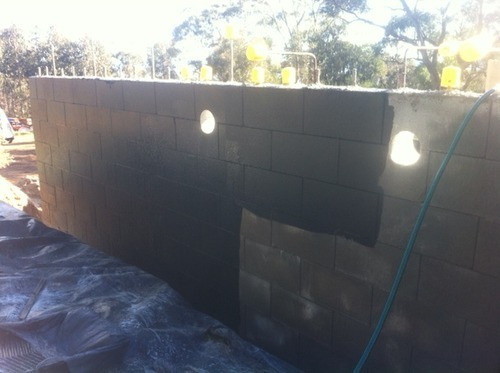 I have also to tank the remaining three sevenths of the first course of blocks but I will have plenty of room to move along this length of wall so the rest of the job should require much fewer colourful adjectives than has been the case today.